In a world of excellent musicians, the truly unique are few and far between. 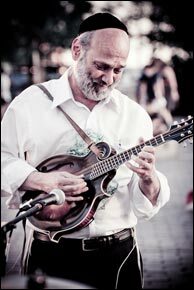 Andy Statman is one of the instantly recognizable voices on his chosen instruments, which these days center on mandolin and clarinet. His adventurous music is very deeply rooted in bluegrass traditions created by Monroe and McReynolds, and first generation Klezmer learned directly from masters such as Dave Tarras, blended with a passion for the free expression of saxophonists John Coltrane and Albert Ayler. While the worlds of traditional music and avant garde improvisation may seem at odds, they come together in a satisfying whole through Andy's music. There is no "drive-by" element to style with Andy—when he sought to learn bluegrass, he first learned EVERY available Bill Monroe solo on record, and then sought out every LIVE tape available. When he studied Klezmer with Dave Tarras, Tarras was so moved by Andy's devotion as to bequeath his clarinets to him. That, my friends, is commitment. Andy has always been a patient and generous teacher, and I am delighted that he is becoming involved in master classes at Berklee College of Music in Boston. I was privileged to witness some of these one-on-one sessions, where Andy developed instant rapport with the students, and encouraged them to get the most expression and depth from the melody. The students were responsive, thrilled and energized by these sessions. For many years, his sound was delivered via a lovely early 1920s Gibson A2Z; distinct from the pack of F5 style mandolins. Recently, Andy has adopted an F5 style Kimble. While there are obvious sonic differences, I must say as a fan of Andy's playing for 35 years, I hear only subtle changes. The strength of his playing is in his hands, heart, and mind, and transcends the choice of instrument. A Boppin' Crib from Andy's forthcoming CD Old Brooklyn. Written by Andy Statman with Andy on mandolin; Byron Berline, fiddle; Paul Shaffer, piano; Jon Sholle, electric guitars; Jim Whitney, bass; Larry Eagle, drums; The Statettes, clarinets. Recorded by Damon Whittemore at GodelString Brooklyn, with additional recording at Dubway Studios, NYC; mixed by Michael Brorby at Acoustic Recording, Brooklyn; produced by Edward Haber. Question from sgarrity: Can you tell us about the differences in playing your old snakehead A2 vs. your newer Kimble F5? Did you have to change your playing style any or the right-hand attack? Do you feel these mandolins inspire you differently? Are you still playing the A2? Andy Statman: I'm generally a one instrument person, so after making the switch to the Kimble, I've barely opened the case of the A2Z. While liking the sound of the oval hole (A2Z), over the many years that I've played it, I found the neck to be less than friendly, which limited my range of expression. While finding ways to work with it, I was never satisfied and was always looking for a mandolin with a D'Angelico guitar type neck. I've found these types of necks on the raised fingerboards of an F5. I had initially tried some wonderful sounding round hole mandolins with raised fingerboards, but they couldn't match the sound of my 85-year old Gibson. So I moved on. Will Kimble graciously allowed me to hold on to the mandolin for awhile without commitment to see if it would work for me. And after a period of indecisiveness I decided to go for it and never looked back. At this point I find the F5 offers me unlimited possibilities, and I'm thrilled to play it. One of the main acoustic differences between an F-hole mandolin and an oval hole mandolin is that on an oval hole, the sound you hear is the sound that you get; on an F-hole mandolin, the sound shoots straight out rather than above or in all directions, and you're not hearing exactly an accurate representation of what a microphone would pick up or a listener sitting in front of you would hear. This difference in sound projection took a little getting used to. In terms of the right-hand technique, there seems to be a bit more tension on the strings of a raised fingerboard, and there can be a "dangerous" tendency to always play close to the neck, which will limit the different tones and colors that can be produced by the mandolin. In terms of inspiration, playing the F5 has allowed me a greater expressive palette for the types of music I'm playing now. Interestingly, a few months after my switch from the oval hole to the f-hole, I wound up changing clarinets as well. Andy Statman on mandolin, Larry Eagle on drums and Jim Whitney on bass with Jerry Wicentowski on vocals and guitar. Jerry shows the trio the waltz Please Search Your Heart during a rehearsal at the Charles Street Synagogue, January 19, 2010. Question from sgarrity: And when do we get another recording from you? Andy Statman: A 2-CD set, Old Brooklyn (Shefa Records) will be available early next year and will include my trio with Jim Whitney and Larry Eagle, along with Byron Berline, Jon Sholle, Ricky Skaggs, Béla Fleck, Paul Shaffer, Bruce Molsky, Art Baron, Marty Rifkin, Bob Jones, and Lew Soloff. Question from JeffD: You're my first mandolin hero! Flatbush Waltz was the first mandolin record I ever bought. The tune Barbara in the Morning can still make me cry and Flatbush Waltz can make me hungry. My question: I have played clarinet, bassoon, and other woodwinds. I have always wanted to ask, has playing the clarinet affected your approach to the mandolin, either in playing mechanics, or how you phrase a melodic line, or single note, or how you visualize a piece you are about to play? I sometimes think I hear things in your mandolin playing that can be understood more with a "clarinet mind," the way you improvise and some of your licks, and perhaps some "anti-clarinet" in the exuberance of your harmonies, as if being suddenly free of the strictures of single-note-at-a-time. Andy Statman: I was a bluegrass fanatic, in my early to mid-teens. By the time I was seventeen I was interested in playing saxophone like Albert Ayler and Jackie McLean and my interest in bluegrass had diminished. My main mandolin influences up to that time, about 1967, included Bill Monroe, Bobby Osborne, and Jesse McReynolds, as well as Frank Wakefield, John Duffey, Herschel Sizemore, etc., under the watchful and encouraging eye of David Grisman. From 1967 on I mainly listened to all types of jazz and developed an equally ardent interest in exploring "ethnic music of the world." As I've been privileged to study with David Grisman, I was also privileged to study with the great saxophonist Richard Grando and the old world clarinetists Dave Tarras (klezmer) and Pericles Halkias (Epirot Greek and Albanian), amongst others. When I'm playing either the mandolin or the clarinet, ideas flow freely on both instruments—one unconsciously influences the other—it's all about expression. 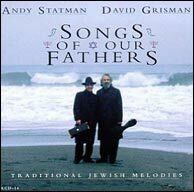 Songs Of Our Fathers - Andy Statman and David Grisman, from 1995. Click to purchase. Question from Jim MacDaniel: I enjoy both your mandolin and clarinet work, and while your mandolin CDs are among my favorites, I especially love Songs of our Fathers that you recorded with Mr. Grisman, which I find a very beautiful and soulful listening experience. Which instrument do you feel more connected to spiritually when playing? And which one do you have more fun with, if different? Andy Statman: As a partial continuation of the last question, the clarinet allows for a more legato singing type voice than is expressed on the mandolin. One of the advantages of the clarinet is that you can do prolonged bending of notes and glissando which is quite difficult or impossible to do on the mandolin. While certain tunes are stylistically more suited to one instrument than the other, I connect to both of them in a very deep way, and need both for the complete picture. Because of the stylistic nature of my clarinet repertoire, the music is more overtly spiritual and can go to a deeper place, although some mandolin pieces go equally deep; so it's mainly a question of repertoire and heart. As for fun, I have a blast playing both instruments. 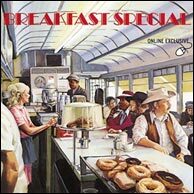 Breakfast Special, 1976. Band included Richard Crooks, Kenny Kosek, Roger Mason, Stacy Phillips, Andy Statman, Jim Tolles and Tony Trischka. Click to purchase from Rounder. Question from MandoNicity: First, thanks for taking our questions! I first heard you back in the early 70s when you were working with David Bromberg, touring with the Demon in Disguise band which I got to see perform at the MainPoint in Philly. There was so much talent in that group, can you tell a little about what it was like playing in that group? Andy Statman: David Bromberg was my first full time professional gig. Until then I had been an amateur, but always felt there was this invisible wall between being amateur and full-time professional. Through playing with David, I saw myself walk through that invisible wall. David was one of the first people to combine, folk, bluegrass, blues, ragtime, and rock in a commercially touring band, and playing both mandolin and saxophone allowed me a full range of expression. David was very kind and included me in a number of recording sessions with the Grateful Dead, Dr. John, Bob Dylan, and others. When I was with his band, each player was an inspired musician. Two bands that came out of David's group that I played with were Breakfast Special and The Fabulous Torpedoes with the late great guitarist/bassist Steve Burgh. Question from JimDola: Hi Andy. I'm wondering if you approach Jewish music differently on clarinet and mandolin. Many of your clarinet tunes sound like meditations and the spirituality inherent in the music is very clear. I would expect that you aim for the same thing with mandolin, but I'd like to know if you think about the two instruments as having the same spiritual role in Jewish music, or not. Thanks very much. Andy Statman: See above. There's a long tradition of professional Jewish instrumental playing on the clarinet. Mandolin playing was generally not an integral part of the Klezmer ensemble. Question from William Grant Macdonald: In teaching situations, what elements do you focus on to help students develop good habits, i.e., ways to play more easily and with better tone? Andy Statman: I find that most of my students have varying degrees of right-hand problems (of which many are unaware) that greatly diminish the expressiveness of their playing. So usually the proper use of the right hand becomes the most important issue to deal with at first. Andy Statman Trio. L-R: Jim Whitney, Andy Statman, Larry Eagle. Photo credit: Ilana Pelzig Cellum. Question from swampstomper: How did you get involved with Country Cooking back in the early 70s? Originally they had Lou Martin (Harry Gilmore) on mandolin and then Russ Barrenberg played mandolin with them. You also played sax with them, IIRC. How influential do you think that group was and in which direction? Obviously you, Wernick, Barrenberg, John Miller and Trischka all went on to success in different ways. Andy Statman: I've known Tony since 1966 when he came to NY and we played some gigs together. Around 1970 or 1971 I got a call from Pete Wernick who I'd known from my old bluegrass days (1964-1967) who asked me if I'd be interested in recording with Country Cooking. It's impossible for me to gauge how influential that band was, although many of the ideas that we were exploring in 1972 both in Country Cooking and Breakfast Special I continue to hear people in bluegrass exploring today. Bluegrass Masters: Jesse McReynolds Mandolin, by Andy Statman. Now out of print, but used (and very expensive) copies are usually available on amazon.com. Click to view availability. Question from swampstomper: And is there any way you can get the McReynolds method book officially re-published, even as a pay-per-view download? Andy Statman: People who are interested in the book should let the publisher know that there's a demand. I'd love to see it back in print. Question from MandoNicity: I would like to know how that project (the McReynolds book) came about and also if you're aware of the crazy high prices for a used copy and the interest many have for a reprint. Andy Statman: I had already done a bluegrass mandolin method book for Oak Publications, and they were interested in doing a Masters of Bluegrass series and asked me to do a book on Jesse. Having studied his playing, it was a natural for me. I was thrilled to get even deeper into his style and relearn his brilliant solos. The book afforded me a chance to get to know Jesse who I consider to be one of the geniuses of the mandolin. Forgive me, but I'm completely unaware of any high prices for copies of the book. Question from Dave Gumbart: Thanks for taking our questions. I had an opportunity to see you play last month and enjoyed it tremendously. What can you tell us about playing in a band setting as a trio? How does this configuration suit your current musical direction? Had you played with (bassist) Jim Whitney and (percussionist) Larry Eagle before this trio got going? Thanks for sharing your music with us. 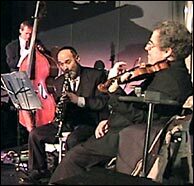 Andy Statman: Previously I had been playing in my quartet or quintet which was piano-based. I felt a chordal instrument was too restrictive for my playing and just having a bass could imply many different harmonic choices without explicitly locking into one. This allowed me a much greater freedom of spontaneous expression. For recording certain styles of music I will occasionally add guitar or piano where it feels appropriate, but live I generally prefer the openness of the trio. I met Jim through playing with Matt Glaser and the Wayfaring Strangers. And Larry I met at the 50th birthday of my dear friend, the late Richie Shulberg (Citizen Kafka). Question from Nelson Peddycoart: Thanks for the dedication to the mandolin and for taking questions. I have your Jazz Mandolin book and enjoy it very much. I bought it for the insights into Monroe style playing, but have explored many other parts of it. I feel that jazz and bluegrass are (on some level) musical cousins. One might be the city mouse and the other the country mouse, however. Do you have any thoughts to share on any connection/similarity, etc that may exist between the jazz form and bluegrass? Andy Statmans Homespun Lesson Series, From Bill Monroe to BeBop. Click to purchase. 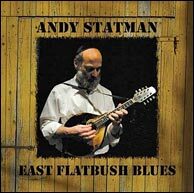 Andy Statman: Some of the older forms of jazz have a definite influence on the earliest bluegrass. By the 30s and 40s everyone listened to the radio and heard everything. A number of the old-time musicians could play swing, but weren't recorded doing that. The great slide guitarist Robert Johnson played Tin Pan Alley songs but wasn't allowed to record his versions of those. Musicians traditionally have big ears and are open to all sorts of musical influences; and as Bill Monroe says, you have to know what's good for the music and what hurts the music. Question from Don Grieser: Andy, could you talk about the spiritual nature/aspects of your music/your approach to music? It comes through in the non-Klezmer tunes as well. Andy Statman: Whenever I start to play a gig, I feel like I've walked into a huge department store, with thousands of dazzling items before my eyes. I just pick freely from these items, so to speak. I never know what I'm going to play or how I'm going to play it. What I try and do is let the music take me on a journey of exploration. Whether it's a fiddle tune or a deep meditative tune, the approach is the same. The main thing to do is to get into a place inside yourself where the music just happens and becomes as natural as speaking. 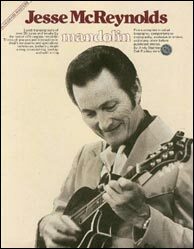 Question from Don Grieser: What is there about Bill Monroe's mandolin playing/composing that made you start with his music on the mandolin? Thanks so much for all the music and inspiration. Andy Statman: My teacher David Grisman immediately exposed me to Bill Monroe which I had not listened to much before (having initially been a guitar and banjo player). David showed me how Bill Monroe expressed the deepest feelings in bluegrass. Exploring Monroe's music became a lesson in musical aesthetics, integrity, and idealism which still continues to motivate me in all my playing. Andy Statman with his 1923 Gibson snakehead mandolin. Photo credit: Ilana Pelzig Cellum. Question from Mandoviol: Hi Andy. A lot of people listen to the styles of music they play (I know I do). Therefore, if we were to take a look on your MP3 player (assuming you use one), could we expect to find a lot of jazz, bluegrass, and Klezmer, or would we find other genres altogether? Thanks, and please continue to be an inspiration. Andy Statman: Each day is different for me, but in the last twenty-four hours I listened to early Coleman Hawkins, Charlie Parker, old-time fiddle music, mainland Greek clarinet recordings form the 1920s, Dave Tarras, Shostakovich, Bill Monroe, Ben Zion Shenker, and Little Walter. East Flatbush Blues - 2006. Click to purchase. Question from Gerry Hastie: Hi, Andy. East Flatbush Blues is amazing. I was knocked out when I first heard it. What amazed me was you taking a tune like Bluegrass Stomp or Rawhide and whilst starting around a fairly standard theme of the melody it then goes into the stratosphere before coming back again for that neat & tasty resolve. It would be great to hear your thoughts about your approach to improvisation and where one should start learning to do that with a tune. Andy Statman: While there's not enough space here for a lesson in improvisation, when improvising, particularly on a fiddle tune, I always have the melody in mind. That enables me to create improvisations based on the melody. A good way to start is once you've mastered playing a melody, start creating your own variations on it and either write them down or tape them. Memorize these variations, and practice them until you can play them as well as you play the melody. Then begin playing the melody and incorporate these variations when you feel inspired to. Through this you'll develop a sense of spontaneity and begin to develop your own musical language and voice. In closing I'd like to thank everyone who submitted questions for their interest in the music that I play and I'd like to also thank Scott Tichenor for asking me to participate in this question and answer series and for the tremendous benefit we all receive through the Mandolin Cafe. Andy Statman accompanying the famous cantor Ben Zion Shenker on the yortzeit seudah of one of the Modzitzer rebbes. Photo used with permission from the Jewish Music Report web site and photographer Joel Lowy. Andy Statman and Ricky Skaggs. Photo credit: Bradley Klein. 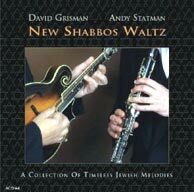 New Shabbos Waltz - David Grisman and Andy Statman, 2006. Click to purchase. Andy Statman on mandolin, Jim Whitney on bass and Larry Eagle on drums, percussion and plate, performing a decidedly non-traditional version of Arkansas Traveller. Recorded on the WDVX Blue Plate Special Radio program in Knoxville, Tennessee, February 15, 2010. Thank you Andy. Thank you Mandolin Cafe. I've been hearing the name Andy Statman for awhile now, and this interview finally sparked me to go out and get some of his music. I just downloaded East Flatbush Blues and Flatbush Waltz off of itunes and Andy's Ramble is on its way! Amazing talent and musicianship with Inspiration nothing short of transcendental. Thank you Andy for sharing a bit of your world with us. And as always Scott I tip my hat to the high standards you set for the Cafe and our little community. Wonderful portrait of a wonderful musician! A reminder: Andy, Larry and Jim play most weeks in NYC at the Charles St Synagogue. The trio is really something, a true meeting of musical minds. To call them a rhythm section doesn't do those guys justice. Each shines while providing a 'foundation' that frees Andy to do his thing. And thanks Andy, and producer, Ed Haber, for providing that swingin' cut from the upcoming "Old Brooklyn". Arkansas Traveller will never be the same after this..thanks again for another great interview! great interview,thank's Andy,and thanks Scott.. Here's a photo of the headstock of Andy's Kimble mandolin. You'll notice that it is also 'flawed', like the back, with needlessly beautiful irregularity! There's a 'flame' or 'puff of smoke' of lighter wood running up from the Gibson A-3 curlicue, through the maker's name. It's actually, pretty visible when seen head-on. Here's what the luthier said about the striking one piece back: "I thought this back was very cool but didn't think it was suitable for a custom order because it was so strange—wasn't sure who would or wouldn't like it." I was fortunate to begin taking lessons with Andy a year ago (before a health issue interceded on my side), and I wanted to thank the Cafe for the heads-up that he had been taking-on students in the first place, or it wouldn't have happened. Of course I'd like to thank Andy for the inspiration -- not just teaching me to play bluegrass, but the history, evolution and oral traditions. He even let me play the Kimble -- though I was really too scared to play much. Andy's the real deal, and a very thoughtful, generous and patient teacher. Of course the little things he was picking unconsciously way up the neck while he spoke are light years beyond what I'll ever have the dexterity to play, but I won't ever give up! man that cut from the forthcoming album is awesome!!! Killer chops...and Andy's last solo is amazing. 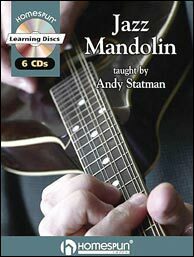 Andy will be teaching at this year's Mandolin Symposium! How cool is that?! In addition to coletrickle - his solos are hazy CRAZY. Berline's take off the top was awesome and inspired, groovy with a funk and then..... Andy resolves a trajectory to Mars or some distant galaxy before settling us back gently to earth without a bump, but a groove. Andy rules the world of jazz mandolin... As well as damn near every other genre. His crosspicking solo on Up in the Morning (on Andy's Ramble) is without equal... AMAZING! This was a fantastic interview! Andy gave very detailed well thought out answers to our questions. Big Thanks to one of my Mando heros! Andy, thank you for such a wonderful interview and your willingness to share with us!! Andy is a real mandolin inspiration to me. Thanks for participating in the interviews! He has been there twice before.......I took as many of his classes as I could. Awesome interview with one of the most emotional/spiritual musicians of any discipline. Andy is like John Coltrane; you have to be willing to go with him wherever he goes but man is it worth it. Amazing ideas and execution. Andy's playing also reminds me of the Chick Corea Akoustik Band I saw in concert a long time ago where Chick said to the crowd, "You need your melody radars on tonight." right you are John... good post. really dig the Picasso "Woman With a Mandolin". Just saw that at MOMA a few months ago... one of my faves... duh! Amazing, creative musician and cool dude. I especially like his beanie. Reminds me of the one's from the 60's...he just needs a propeller on top! Thanks Andy and MC. Chorus after chorus of amazing ideas.......like a stream......music just flows out of him. It "is" like a spiritual experience ........as he taps into the source, somewhere between inspiration and intellect......and the ideas flow....... on either of his chosen instruments. Huge fan of Andy. A wild man on the mandolin, who comes by it honestly. Steeped in every tradition, and a creator of his own. I played Flatbush Waltz for my parents' 30th anniversary. They were in tears. Thanks for being an inspiration, Andy! Jim Roberts: His "beanie" is called, in Hebrew, a kipah (kee-pa) or, in Yiddish, a yarmulke (yam-u-ka). It's a head-covering that more observant Jews wear to signify recognition of god "above" and as a kind of uniform. Man of Wax: Thanks for the clarification...we see alot of hats worn for religious reasons here in Kansas, too. Lots of staunch Lutherans and observant Mennonites around. No "uniforms" though...a few robes here and there and an occasional toga on campus. I saw a few Shriner's with some crazy looking hats similar to Andy's (but a bit more pronounced on top) at a parade a few weeks ago that may signify some sort of religious recognition like you describe but what that recognition is is beyond me but perhaps it has something to do with a "being from above." Or, it may have something to do with the liquid they were consuming from their flasks! Regardless of hat, beanie, yarmaduke, etc., styles, Andy certainly is gifted and we all benefit from the talent he shares with us. His spiritual life is as an Orthodox Jew, at home in Brooklyn's Flatbush neighborhood, not far from where he grew up in Queens. As a kid going to Hebrew school, he was hungry for music and roots, but not traditionally observant. These days, he doesn't hide his observance. "The way I dress is the way I dress," says the man who now goes everywhere in a black velvet kippa, white shirt, black pants, dangling tzitzit, and the occasional black hat. "Just being a frum [traditionally observant] person, this is the world me and my family live in. I've never put on a costume for jobs that I played. I came up playing music in the late '60s and early '70s. The way we dressed offstage was the way we dressed onstage. I'm there to play the music and that's what it's about." Just FYI, adding to the discussion. . . . This may answer some of the questions being asked. If you ever have a chance to see him in person, you owe it to yourself to do so. It's a remarkable experience to be in the same room with him and he's a very genuinely wonderful person to speak to. I hope to make it back to the Village to see him in the next year. Noting the anniversary of the publication of this interview. If you haven't listened to the streaming MP3 in the article, it might alter your paradigm. Another anniversary for this interview with one of the true treasures in the mandolin (and clarinet) world! Andy Statman is still one of my heroes. Superheroes. This guy is just plain incredible,,he's been one of my big influences since I first heard him in the '70's. His solo on Black Mountain Rag from Fiddle Tunes for Banjo Rounder album from 1981 is unbelievable innovative!